My doctors always told me I was fine. I was not fine, taking eight different meds, walking on a walker, barely able to breathe, sometimes. I had a major heart attack two days after a ‘fine’ report. I called Carolyn from the hospital; I’d been reading her column in the newspaper for years. We met on the day I was discharged and my family changed our diet and lifestyle that day. Now, I’m off all meds and the walker, and feeling better than I had in 25 years. Now I truly know what fine feels like. It feels like breathing freely, walking easily, enjoying my family, traveling, and it feels like no doctors’ appointments. That’s what fine feels like. All of my family have benefited from that first phone call that saved my life. 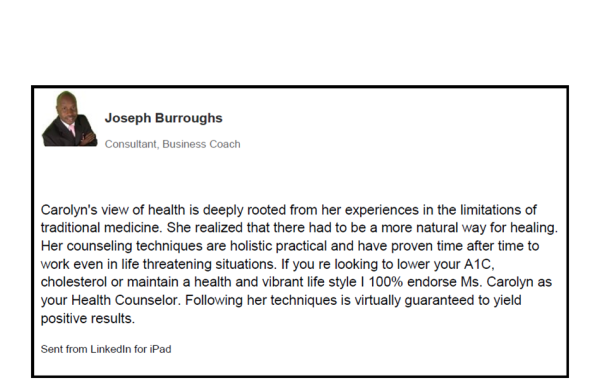 I have GREAT praise for Carolyn Guilford, so if you want to feel fine, you can call Carolyn, I’ll be busy! Carolyn Guilford has been a God-send to our family. We thought we were eating healthy, until a health scare proved that we were not at all on target with our eating habits. Carolyn put us right at ease and quickly allayed our fears. She put us on the path to a healthy lifestyle and was a wealth of information, which we soaked up like a sponge. As we were learning, there was never a question Carolyn could not answer. She encouraged us to find foods and recipes we really enjoyed. She shared her tips and tricks to make the new lifestyle easy to adapt to. She followed us every step of the way...from grocery shopping, to kitchen tools to our medical follow-ups. The doctors were amazed at our new numbers and that a potentially serious health issue had completely reversed with just 90 days of clean eating. We owe our new-found lifestyle and environmental awareness to Carolyn and we look forward to approaching the best years of our lives! “Health is a Choice”; both books are a tremendous asset to me. Eating a healthy well-balanced diet is part of the answer to good health. Your book is an inspiration and one that I will adhere to for the rest of my life. You have touched upon issues that even doctors will not tell you. It is also helpful that you have added some simple recipes for healthy snacking. 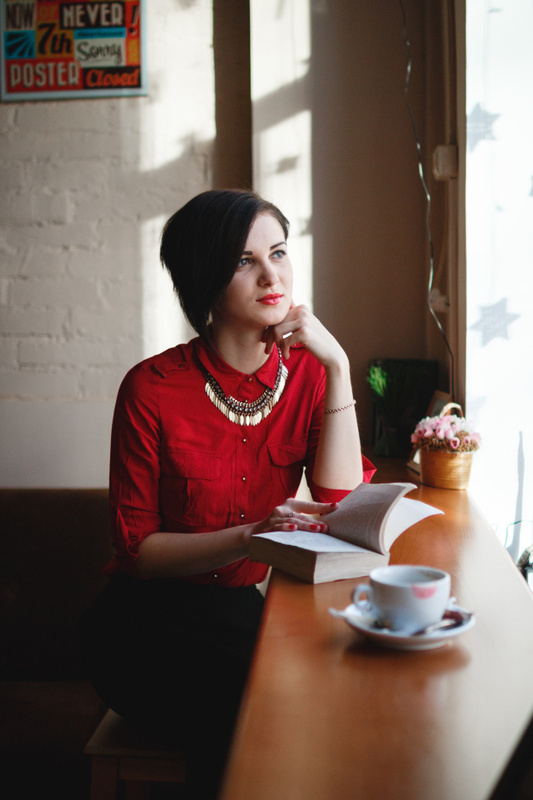 Your book has provided to me new and innovative ways of thinking, living and eating. I am proud to have known you May God continue to bless you as you research ways of helping others in what you love to do best; helping people to live longer and better and healthy lives. ... on the neti pot. i just started using one last week and to say i love it is putting it mildly. The neti pot took care of every sinus and allergy issue.. The cost is minimal compared to allergy pills. Carolyn's work in the areas of health and wellness is not only appreciated, it is a much needed gift in a life where so many of us forsake our bodies by what we - do and do not do - to ensure that we are living in accordance with good nutrition and exercise. My mother called Ms. Carolyn for her opinion after a doctor told her it was time to take her diabetic foot off. Ms. Carolyn worked with mom for over 6 months, teaching her about food, exercise and new lifestyle measures. Today, fifteen years later, mom still lives alone, healthy and happy. No Surgery, and the high blood pressure, no diabetes, and chronic pain is gone. What a Blessing for our family. I worked with Carolyn for six months and with her knowledge in nutrition and health she helped me to overcome many of my health issues. I now sleep better, feel less pain and enjoy all around good health. She also provided many wonderful recipes, a shopping list and resource guides. I’m on my way to a much healthier life thanks to Carolyn. .... the words you will be reading on the following pages you will literally be able to add health restoration, vitality, peace of mind, and years to your life! Carolyn does not recommend “snake oil” that we have to search the world and pay a fortune for. Her writings remind us of things that we all know are good for our health such as eating clean whole foods, exercising our bodies as best we can and un-cluttering our homes, work places and our minds. It is valuable information for anyone who wishes to improve their overall health. with the goal of reducing inflammation in my hip. It ended up improving my overall health. Carolyn’s follow up calls helped keep me on track and my health profile steadily improved. I highly recommend Carolyn to anyone who wants to improve their quality of life.